For his eighth album, Richard Wileman has turned to familiar and not so familiar topics, with pieces inspired by vampires, Max Ernst paintings, actor Peter Cushing, and the short fiction of Sheridan Le Fanu and Robert E. Howard. The compositions exude these sorts of highbrow reference points and are perfectly suited to Wileman’s unique brand of elegant and classically oriented chamber compositions. That means you’ll hear plenty of woodwinds, piano, classical guitar, and some brass, but little in the way of drums or electric instruments. 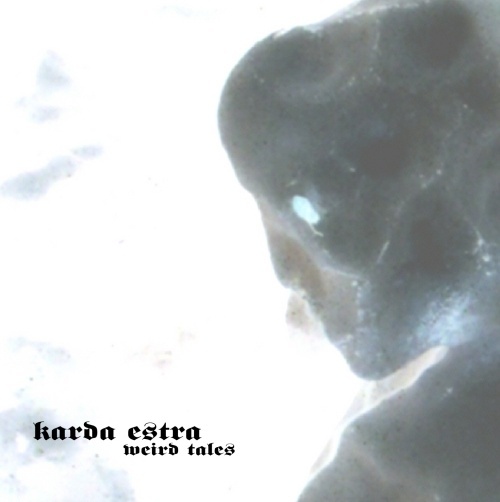 As with past Karda Estra collections, the material often tugs at your subconscious, playing upon dark and unsettled realms of thought and dreams. I’ve seen this one described as moodier and darker than past albums, though if so it’s only a matter of degree. Wileman’s harmonic craft is fully intact and he continues to demonstrate his ability at weaving melodic lines that are simultaneously pretty and haunting, perhaps best seen in “The Whitstable Host” and “The Atom Age Sense of Impermanence.” Sonically the eight pieces have the velvety charm of past outings, with kudos once again to Ileesha Bailey’s gorgeously ethereal vocalizations, Carol Hansford’s cor anglais and clarinet, and of course Wileman’s own work on classical guitar and keyboards. This is the sort of thing to curl up to with a cup of tea and a good book, preferably a horror or murder mystery, and I can enthusiastically recommend it to fans of Wileman’s past work.